Studies have shown that three-dimensional VB imaging adds valuable information to conventional helical CT imaging. Reconstruction of standard CT images to thinner intervals improves spatial resolution of CT data; i.e., smaller lesions are better resolved. Figure 4 Surface-rendered three-dimensional reconstruction of the trachea of 57-year-old man with tracheobronchomalacia. 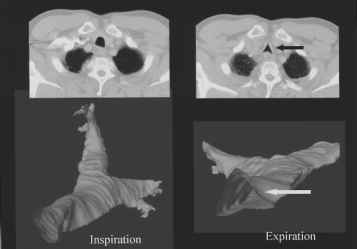 Inspiratory CT (left-hand upper and lower images) shows that the trachea and proximal bronchi are widened and enlarged. 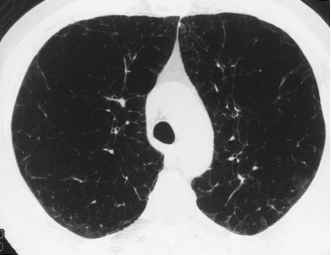 Expiratory CT (right-hand upper and lower images) shows increased narrowing of the proximal trachea (arrow). (Fig. 3), and palliative stent placement in airways constricted by tumor or scar or tracheomalacia (Fig. 4). Imaging of the three-dimensional airway has improved the understanding and confidence of image interpretation for clinicians [16-18]. Three-dimensional images provide better orientation of both the airways and the adjacent mediastinal and hilar structures. The ''fly-through'' feature helps the bronchoscopist prepare for the actual procedure by providing a road map of a patient's airway anatomy, thereby limiting unanticipated findings. In this sense, VB has the potential value of decreasing bronchoscopy procedure time by guiding the bronchoscopist to an obstructing airway lesion, displaying abnormal lymph nodes and their location with respect to airway landmarks, and showing the best approach for transbronchial needle biopsy. Another feature of VB is the ability to rotate images on the computer monitor. This interactive, ''hands-on'' ability to manipulate the images helps the physician visually grasp the relationship between the mediastinal structures and the airways from multiple angles. This interactive dimension of VB, plus the simultaneous use of multiplanar imaging, helps the imager reconfirm the anatomic landmarks seen on other views. Unlike the actual endoscopic procedure, the viewer can repeatedly navigate through the airway without any adverse consequences to the patient. Virtual bronchoscopy will never supplant true endoscopy, especially in the evaluation of the airway mucosa or if a biopsy of a mediastinal lymph node or mass is needed for diagnosis. However, unlike the actual procedure, with VB, the imager is able to simultaneously view both the contents of the airway and the extraluminal mediastinal and hilar structures. The mediastinum and hila may be viewed either through the airway walls, which can be rendered semitransparent, or by superimposing multiplanar (coronal, sagittal, and axial) or three-dimensional-volume-rendered mediastinal images.